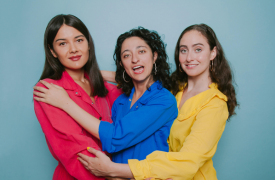 Catherine Cohen (Joe’s Pub, High Maintenance), Patti Harrison (Shrill, Big Mouth), and Mitra Jouhari (High Maintenance, Miracle Workers), are three gals who just don’t get “guy stuff”. They've invited some of the best comedians around town to give them lectures on guy stuff so that they can finally fit in. “It’s A Guy Thing” regularly puts on sold-out shows across the country, at theaters like The Bell House, Union Hall, Industry City, Good Good Comedy, The Hideout, and UCB Sunset, featuring amazing performers across a variety of mediums. The show was been named one of the best alt-comedy shows in NYC by Paste Magazine and one of the best comedy shows hosted by women by Time Out New York.